How do I make an MMD music video? Where do I find the files to make my MMD music video? How do I use MikuMikuDance? How can I find new models and motions for MMD? Bo Beep Bo Beep ! This morning I decided that I wanted to make something new… something fresh… fresh for ME, at least. All I knew was that I wanted to write about making an MMD music video… using files we can find in MMD videos on YouTube. The search for inspiration… and complete links! I started by opening YouTube and searching for MMD (dl, link) … which should show me all of the MMD videos that include DL or link in their titles… and there were pages and pages of them! 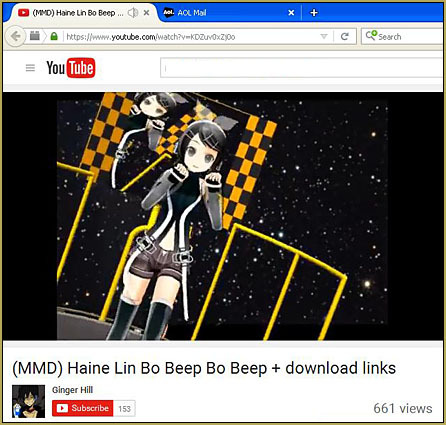 … Ginger Hill’s (MMD) Haine Lin Bo Beep Bo Beep + download links” video! … What fun! That cool little stage, amazing new model, and bright fun music … and a full set of links! … I tried a couple of the links and they seemed to be alive… so I decided that THIS would be my new project. I always like to keep track of my sources for these projects. If you do it WHILE you are doing the work, you won’t have to try to remember where you were as you try to give credits, later. Just keep the window minimized and open it to paste links and write notes to yourself there. I first decided to download that new model… I clicked the link and went straight to the Deviant Art page for the model… only to find that she felt uneasy about distributing her edited model and had taken down the link… so… no new model for me! 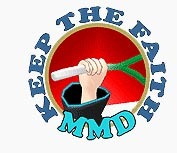 That action is right in line with LearnMMD’s drive to Keep the Faith-MMD! It’s wonderful that she did not want to distribute the model she had edited since she had no permission from the original artist to do so. … tough cookies for me, though! “:o). Next… I went for the Stage model… that link worked fine and I got the nice “Neru’s Soapbox” stage from Trackdancer on dA. 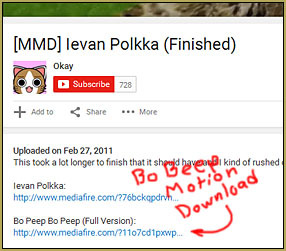 I next clicked on the motion link… which takes you to another video… and there in the body of the description is the link for “Bo Peep Bo Peep (Full Version)“… that link takes you to a MediaFire page where the download button is obvious… and it works just fine… I got the VMD file motion for Bo Beep Bo Beep… I ALSO GOT a pop-up page of advertising that opens up behind your main browser window; just close that page of ads. I next followed the Camera link… another MediaFire page… I got the file… AND another ad pop-up page in the background… I closed the ad page. PERMISSION DENIED … Whoa! … I am a sensitive guy; and my feelings were hurt! … Denied?… strong language! So, back to YouTube… there are MANY of these BoBeep videos, I just had to find one with a WAV download. Hmmm… I kept searching. I finally found one video that had a massive “Pack” to download… turns out it had the motion files AND the WAV file too! So… GET THE WAV FILE HERE. But… NOW I was worried. With YouTube cracking-down on copyright conflicts, would they show my video if I used that song? … but there are so many of them still “up” on YouTube, it MUST be OK, right? I decided to go for it! … and see what consequences lay ahead. … and then I dragged the four new downloaded items into that folder. The next step was to drag and drop that .txt file, my note sheet, into that BoBeep folder so as to keep the notes with my project files. 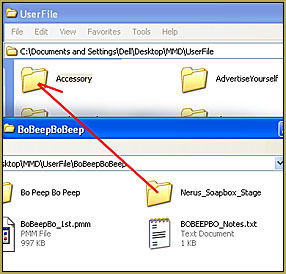 Next… take a look at what’s inside your BoBeepBoBeep folder… you have two VMD files, a ZIP folder and a RAR folder. The ZIP folder you can just double-click and choose the command Extract ALL… and follow the defaults. You will now have the file folder there, ready to use. The RAR folder MAY open that way for you , too… depends on the software package on your computer. You may need to download one of my favorite programs, 7-ZIP… and use it to open that RAR folder… 7-Zip is powerful and you will find yourself using it often! Using 7-Zip… choose the Extract All function… and follow the defaults. Now you can delete those two ZIP and RAR folders. Looking into that big folder that includes the WAV file, we can see that it also includes the Motion file and the Camera file that we already downloaded, earlier. That being so, I decided to KEEP these files, since they are associated with the WAV file… and discard those two other files I downloaded, before. One more note about the ZIP folder. To open it, I just double clicked the zip folder and Windows put up a window and I clicked Extract ALL… followed the defaults… and when I looked inside the finished folder, the new files were in there… along with duplicates of all the OTHER files inside the BoBeepBoBeep folder. Too WEIRD! … the files WERE, indeed duplicates… and I deleted those extraneous files from the Stage folder. I’ve never seen anything like it, before! … I hope it doesn’t happen to you. Knowing that I will enjoy using that stage for other projects, I decided to drop that folder into the Accessories folder… inside the main MMD folder. That way I can always find it. 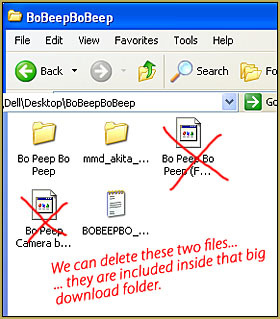 The rest of the files, I left inside the BoBeepBoBeep folder, just to keep them all together. I can always navigate my way to those files inside that folder as I need them, later. 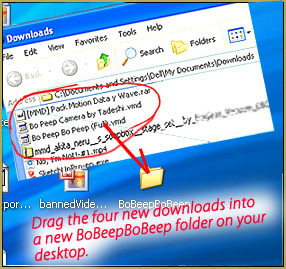 Now you can drag that BoBeepBoBeep folder off of your desktop and drop it into the UserFolder… just drop it in! Okay… the hard part’s OVER… Let the FUN commence! Select a model to do the dance for you. Because this is a family show… you might need to be a bit choosy about the design of your model… because the camera often looks-up from floor level as it sweeps by, longer skirts, or shorts or slacks will make a better choice! I chose the Animasa Miku, as I always do… I loaded the motion data, pushed play… and then noticed those floor-level camera angles… and decided to find a model with slacks or shorts… and I chose Haku. I just about never use Haku… and she has slacks! I loaded the basic Animasa Haku… went to the File menu and chose Load Motion Data. 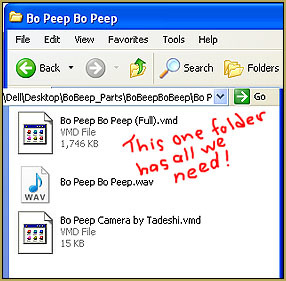 I navigated to the BoBeepBoBeep folder and chose the big VMD file. Haku snapped into the frame-zero position. 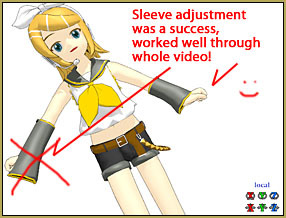 But… when I pushed play, I could see that her costume didn’t fit her very well as there was plenty of motion/location interference and her fabrics were sticking out and sinking in… I decided to try Animasa Rin, instead… the basic Rin that comes with your download. I loaded the motion data onto Rin… pushed play… and was delighted by most of what I saw. Fun! 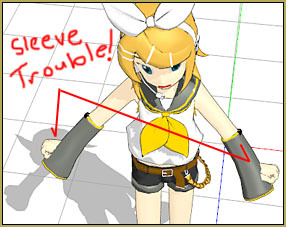 … But Rin has those huge Miku-sleeves and it was obvious I had to fix ’em before Rin could do this dance. I pushed the Left and Right arrows to run through the animation and I decided to stop and fix those sleeves at frame 357. 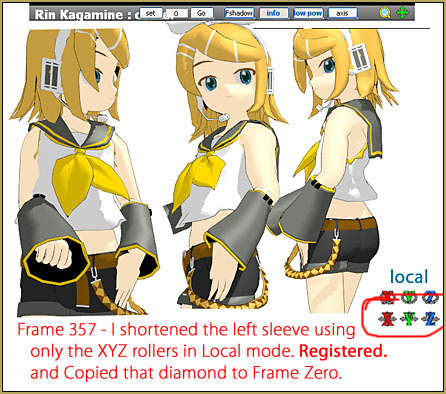 In frame 357, I decided to work on Rin’s left sleeve. Using the green Y axis to shorten the sleeve, and then the X and Z to fine tune the position as shown in the image, there. Once I “had it right”, I REGISTERED the motion… and then copied that Red diamond, Went to Frame Zero… and Pasted that diamond into frame zero. … I played the animation and watched closely… success on TWO levels… 1.) it looked good all the way through, and 2.) the animation motion file did not already have changes for that bone… my change lasted all the way through the animation. PLUS, back in frame zero, I was able to simply PASTE and REVERSE so as to get the RIGHT Sleeve corrected, as well. … All too easy! “:o). In the VIEW menu, turn off the Display Coordinate Axis… turn off the Ground shadow… you can see in the original video how, sometimes, the model casts a shadow beyond the edge of the stage, where there is no floor! 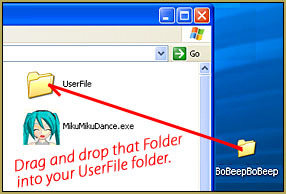 I saved mine into that BoBeepBoBeep folder inside the UserFiles folder, just to keep the PMM in the same folder as the other files for this dance. Did you read the READ-ME that came along with your new Trackdancer stage? … You should ALWAYS read the READ-ME. It gives you the permissions to use the item, and… in this case, it contains the instructions for setting-up the stage! … just follow the instructions… and you will have it! Yup… what will we use to fill the sky? You can set the Background to Black. You can use any JPG image to have a still background image. (You can resize that background image by holding down the Control key on your keyboard as you drag up or down through the magnifying glass in the upper right of the MMD screen.) You can use a Skydome from some stage you already have. The one included with the MMD Batokin Island stage has blue sky and fluffy clouds and a distant shoreline. I took my cue from that original video and went for the “dark skydome with stars” from the Trackdancer LearnMMD Stage that you can download from the Downloads page. Most people enjoy a screen dimension of 16×9… could be 1600 x 900 pixels… but that’d be too large… your file size would be huge! For this project, I went to the View tab and set my Screen Size at 800×450… (figuring half of 1600×900). I see that YouTube has a few recommended sizes… the larger you make it, the larger, huge-er, your final AVI movie file will be. Also under the View menu, at the bottom, set your Frames per Second, FPS, at 30 Max. Wow… doesn’t that look awesome?! BUT WAIT… How LONG is this video? You need to determine the exact number of frames for your animation and video. Enter some big number like 6000 into the Frame Counter… then use the Right Arrow key to move through the animation so you can determine where The End is. I set mine for 6780 frames. 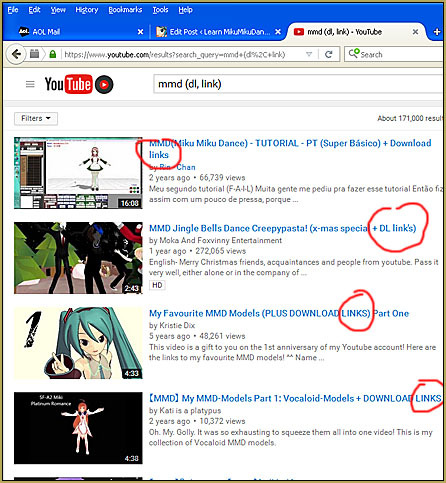 MMD cannot make a video, Render to AVI, until you have given it that info, in those boxes below the PLAY button. Play your animation… enjoy it… watch for any details that bug you “:o). … maybe you can clean them up by adjusting the motions here, and there. 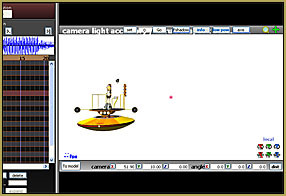 Be sure that your Model Manipulation Panel is set to the Camera mode (not the model’s name). Name your new video and indicate where to save it. By default it will save into your Users folder. I set mine to save on my Desktop. Write a strong title for your video. 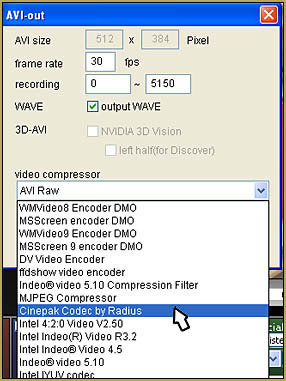 Include MMD so that your video will be found by MMDers. The title for this one might be MMD Rin does “Bo Beep Bo Beep” in style! 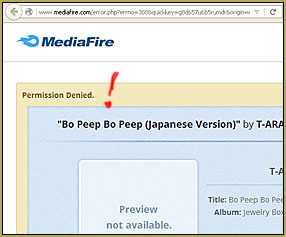 For this project, we could “get away easily” by simply referencing the original video from which we got our file links. We want to do that, in any event … but we could also reference the two Deviant Art pages that we used. As I wrote this article, I created the animation, step-by-step … and so I have a video to upload to YouTube; all 170mb of it! … looks like it’s gonna take over an hour to upload! The music we used in this video is … is Copyright protected. YouTube has been cracking-down on MMDers who use copyrighted music and, if you are a serial abuser, your account could be closed. See my most recent article about YouTube and copyrights. IN THIS CASE… I felt confident to go ahead with the project and create and post the video because I saw so many other MMD videos using this same song, and they had not been taken down. … so … We are safe on this one. 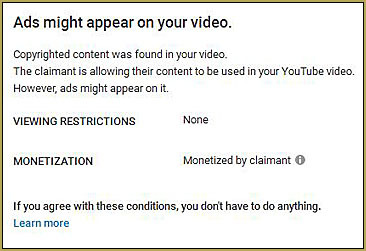 Do not be alarmed if you upload your new video and see the Matches Third Party Content… For THIS song it’s OK.
See ANOTHER Make A Music Video Article! Can i join for free?Just asking. Hmm? … Join what? 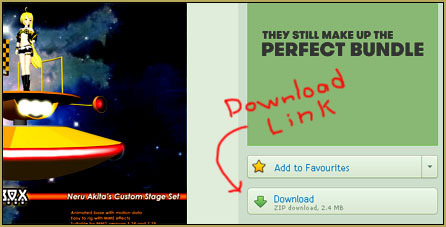 You can download MMD from our downloads page for free… and then… Enjoy! See the StartHere Step-by-Step pages for basic instructions. You could use the right arrow key to find the end of the motion, but most of the time if you use the >| button it’ll find the last registered frame. I have yet to find a situation where that fails to find the end of a pre-made motion. It won’t let me use the motion file! If you do things right, it will.